GEORGETOWN, Del. -- Raja the cat once was lost, but now is found - three years later. On Tuesday, a man brought a stray cat to a shelter in Georgetown, Delaware, run by the Brandywine Valley chapter of the Society for Prevention of Cruelty to Animals. 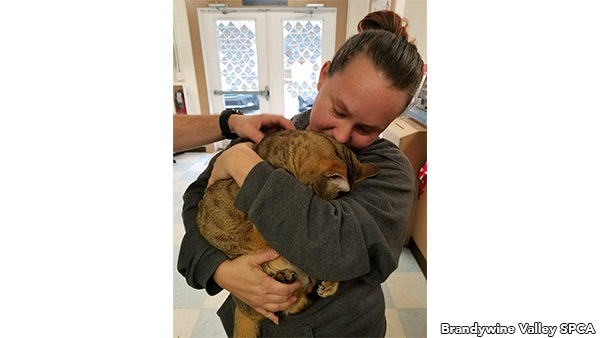 Staffers there found the cat's microchip, and through some sleuthing connected 6-year-old Raja to his owners, the Tuttle family. As it turns out, the Tuttles lost Raja back in 2014 when they were living in Florida. The Tuttles now live in Virginia. The family came to Delaware Saturday to reclaim their prodigal feline.